The 61.3 meter motor yacht New Sunrise, jointly listed for sale by Burgess and Edmiston & Company, has been sold with Steve Sprigg at Galati Yacht Sales introducing the buyer. Built in steel and aluminium by Italian yard CRN to a design by Studio Scanu and delivered in 2000, New Sunrise is Lloyds classed and MCA compliant. Accommodation is for 12 guests in six cabins consisting of a full beam master suite with an adjacent office, a VIP suite, three doubles, and a twin, all with full en suite bathroom facilities and all fitted with oversized windows, providing plenty of natural light. This iconic superyacht has been maintained to the very highest levels and has an interior designed by Francois Zuretti featuring cherry wood paneling, intricately patterned fabrics and extensive use of onyx throughout. At its heart is a magnificent 80 square metre saloon which has a number of different seating areas and is perfectly suited for entertaining, relaxation and fine dining. A full refit in 2014 saw her receive several engineering upgrades and a completely refreshed interior by Michelle Brown. Three distinct deck areas offer great scope for outdoor living, from the expansive sundeck with sun pads, luxurious seating and a Jacuzzi spa pool to a relaxing seating area on the main deck and formal dining on the upper deck aft. Twin 2,000hp Caterpillar engines give her a range of up to 6,000 nautical miles at 12 knots. 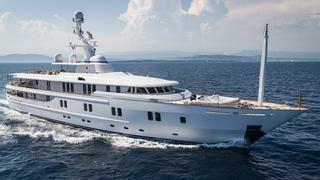 New Sunrise was asking $24,900,000 and will remain for charter with Burgess.